Up until last week, it was still summer here in California. In October. Yeah, I know we get a lot of heat here in Sacramento, but it has normally cooled off long before now. Last week it got close to 95°F. Ugh. One good thing about the heat is that it’s ripening all my remaining peppers in the garden. I grew a lot of yellow bell peppers this year, along with serranos, Italian frying peppers, mirasol peppers and even an Ethiopian berbere pepper. So when life gives you peppers — and crappy, late-season heat — make peperonata. Peperonata is a Sicilian dish of fried peppers and onions, often tossed with some fresh tomatoes and something green, like basil or mint or parsley. It all comes together really fast. In fact, it takes longer to cut all the vegetables than it does to cook the dish. 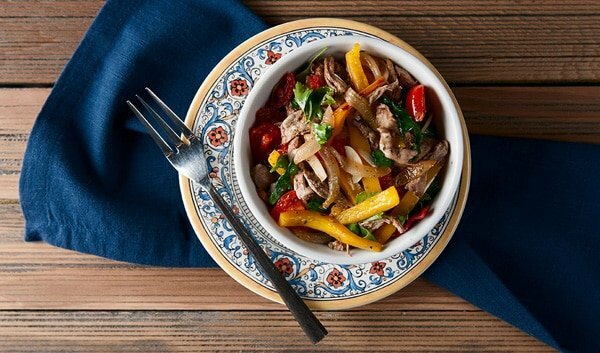 Think of it as an Italian stir-fry. This is normally a side dish, but I decided to make it a main course. I happened to have some pheasant breasts in the freezer, so I poached them in some pheasant broth I had lying around (stop laughing, I have a strange kitchen, OK?) and shredded the meat into the peperonata. It’s a great meal, even better when it’s hot out. Cooking the pheasant is easy. Get the quart of stock or broth (chicken is perfectly fine) simmering, drop the skinless pheasant breasts in, cover the pot, turn off the heat and walk away. The carryover heat will cook the pheasant gently, leaving even an old rooster tender. Obviously you can substitute chicken here, or partridge, chukar, quail or turkey. Just remember that the ratio of the meat to the broth is meant for a couple of pheasant breasts — so if you add more meat, you need more broth. Always err on the side of more broth. And yes, you can reuse the broth for something else later. You can even do this poaching in water, too. Making a good peperonata requires two things: A variety of peppers and high heat. This is not the peppers-and-onions we all love in Italian cooking; that's a slow-simmered dish. This is blasted over high heat on your hottest burner, with your oven fan going full blast. You want the vegetables to be a little charred on the edges, mostly cooked but still al dente. It really is a stir-fry. As for the peppers, just use various colors. This is supposed to be pretty. Green and red are fine, but it's cooler if you toss in some other colors, too. I also like adding a few hotter peppers, just to give the dish an edge. Bring the pheasant broth to a simmer in a lidded pot. Drop in the pheasant breasts, cover the pot and turn off the heat. 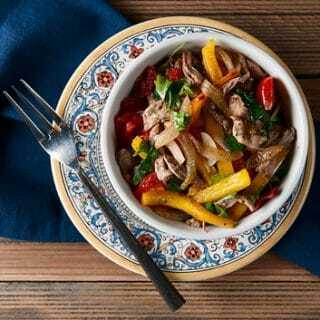 Let the pheasant cook gently for 20 minutes while you cut all the vegetables for the peperonata. Once the pheasant has cooked, pull it out and when it is cool enough to handle (but still warm), shred it with your fingers. You can shop it, too, but I like the texture of the shredded meat. Set it aside for the moment. Put the olive oil in a large saute pan and turn the heat to high. Have the onions ready, and the moment the olive oil begins to smoke, add the onions and saute for 2 minutes, stirring often. Stir in the peppers and stir-fry for another 3 minutes. Mix in the garlic and oregano and stir fry another minute. Add the white wine and use a wooden spoon to scrape up any browned bits on the bottom of the pan. Turn off the heat and mix in the shredded pheasant meat, the tomatoes and parsley. Add salt and black pepper to taste. Serve hot or at room temperature with crusty bread and a rich white wine (like an oakey Chardonnay or a Viognier) or a dry rosé. If you are a beer drinker, go for an IPA or some other hoppy beer. Hank, my stovetop is basically a piece of glass with burners below the glass (i hate it btw). So the heat from the burner remains for a long time, which is different from gas stoves I’ve had, they tend to cool faster. Question is, should I remove the pot from the heat or just let it stay on there? Nevermind that btw dude, we made this last night. It was pimp (along with a little Downton Abby and some tempernillo).